Alexander's Feast highlights and illustrates the power of music to move the emotions, transporting the listener through feelings of sorrowful pity to fiery vengeance, from intimate love to transcendent joy and wonder. Handel's setting of John Dryden's ode combines the expressive poetry with evocative music to bring this text to life. The feast honoring Alexander the Great serves as the backdrop of the scene, as Alexander and his mistress, Thais, celebrate the Grecian victory over the Persian city of Perseopolis. The musician Timotheus controls the emotions of the great hero through his musical whims. He stirs Alexander to prideful arrogance fueled by Bacchus, only to bring him down with a mournful reminder of his fallen and worthy adversary Darius. To cheer him up, Timotheus contrasts the destruction of war with the beauty of love. Eventually, after lulling Alexander to a peaceful sleep, Timotheus wakes him abruptly and incites vengeance, prompting him to burn the conquered city of Persepolis. In our production this year, we take inspiration from our surroundings in the beautiful art-deco inspired ballroom of the Twentieth-Century Club. At our own black-tie dinner party, one of our guests decides that the evening's entertainment will be to reenact Alexander's Feast, with guests taking turns in the roles of Alexander and Thais, as denoted by their crowns. An ambitious tenor takes up the role of Timotheus and recruits others (sometimes soloists, sometimes the entire choir) to join him in his quest to stir the emotions of Alexander through recitative, arias, and choruses. As the musicians journey together through their evening of reenactment, they, too, get swept up in the power of music, culminating with the arrival of the sacred Cecilia. As the evening concludes, Timotheus is called upon to "yield the prize" to divine Cecilia, but it is determined that both "divide the crown." The secular music of Timotheus has led its listeners to new heights, while Cecilia has brought heavenly music to the people. The words of the final chorus aptly summarize our evening here tonight: "Let's imitate her notes above and may this evening ever prove sacred to Harmony and Love." 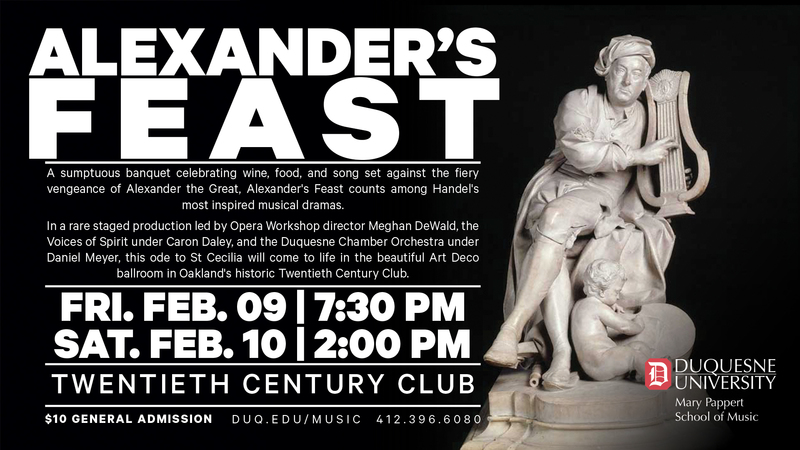 Join us as the Opera Workshop, Voices of Spirit, and the Duquesne Chamber Orchestra present Alexander's Feast at the Twentieth Century Club in Oakland. Performances are Friday, Febraury 9 at 7:30 p.m. and Saturday, February 10 at 2:00 p.m.
For more information, please visit duq.edu/MusicEvents.